Easily board your boat from the port side with the standard 3-step ladder. 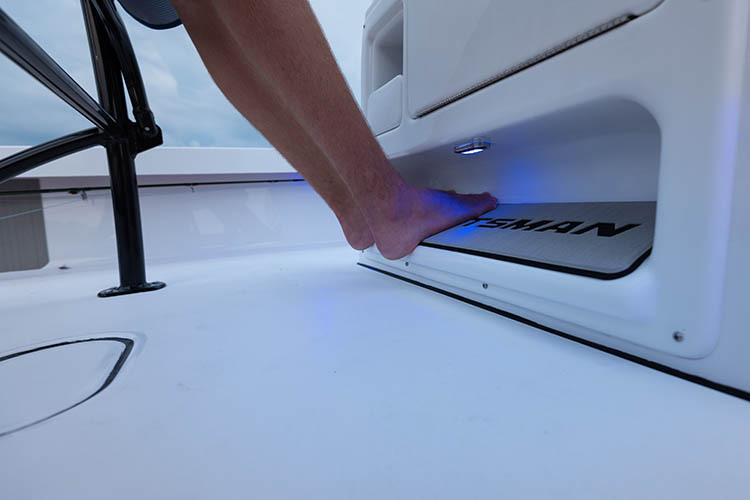 It stows away recessed into the swim platform when not in use and has grab rails on either side for ease of boarding. 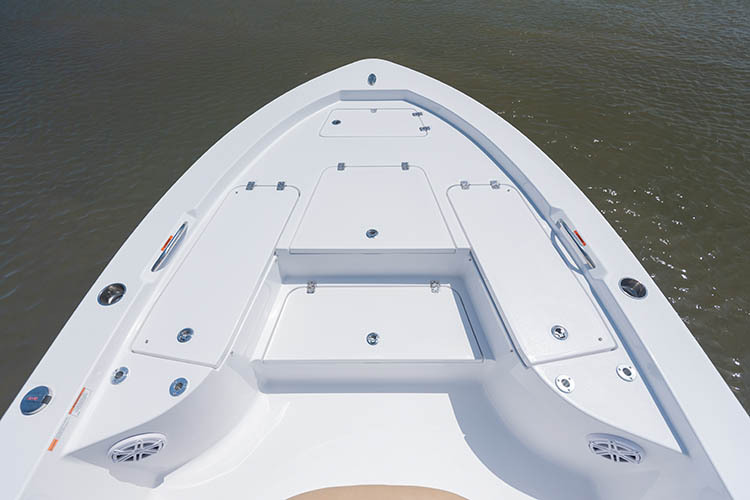 The bow features a large deck with all recessed hardware and lids for a spacious casting deck. Can also be equipped with cushions for the perfect sunpad area. Bow storage is plentiful on board this boat. 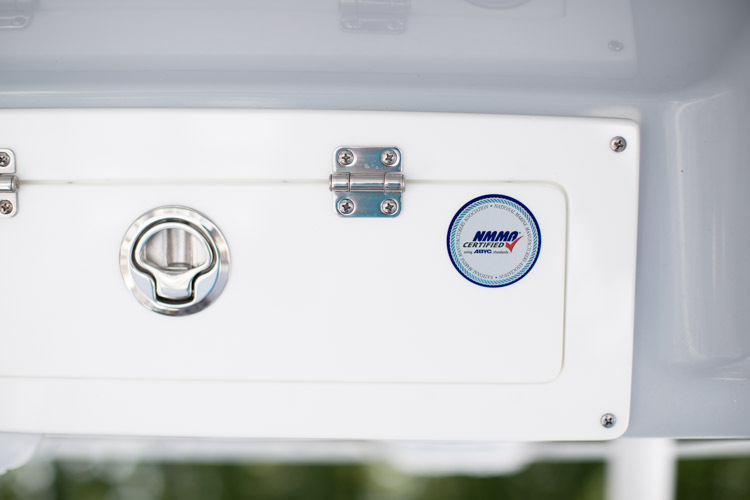 Featuring two large lockable rod storage boxes for up to 10 rods, large fish box and over-sized anchor compartment. Plenty of cup holders and molded grab rails for safety. 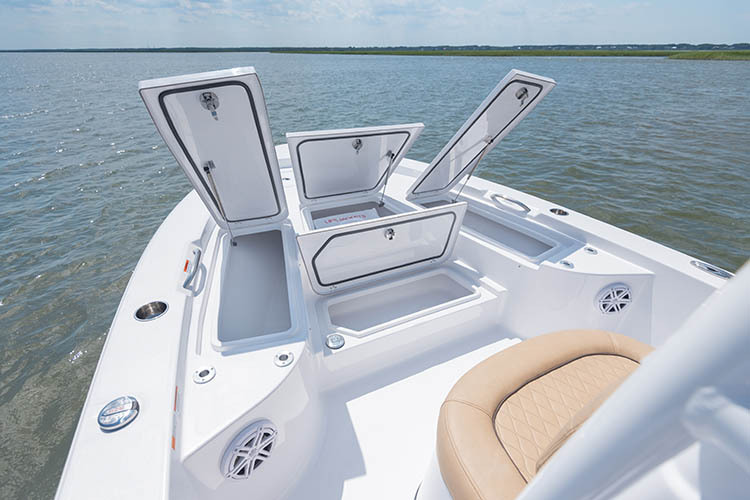 The lockable bow storage safely stores your rods while you are away and includes space for up to 10 rods. 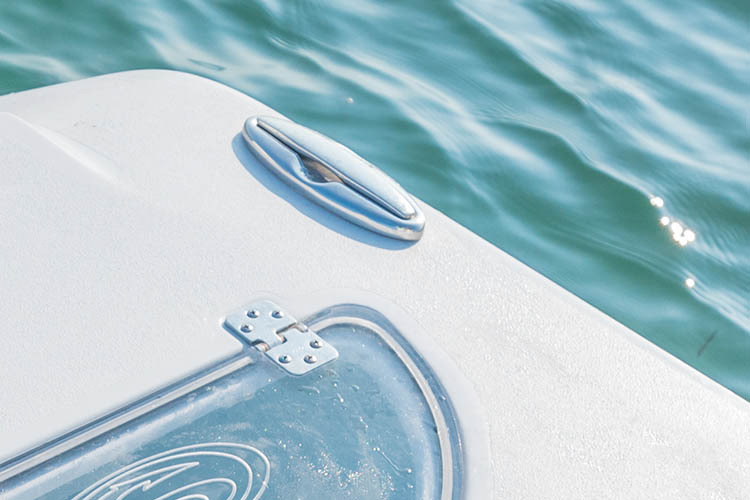 The rods get inserted into plastic guide tubes that prevent the rods from banging around while underway and helps prevent tangling while inserting or removing rods. Stow away your anchor when not in use inside this large compartment. 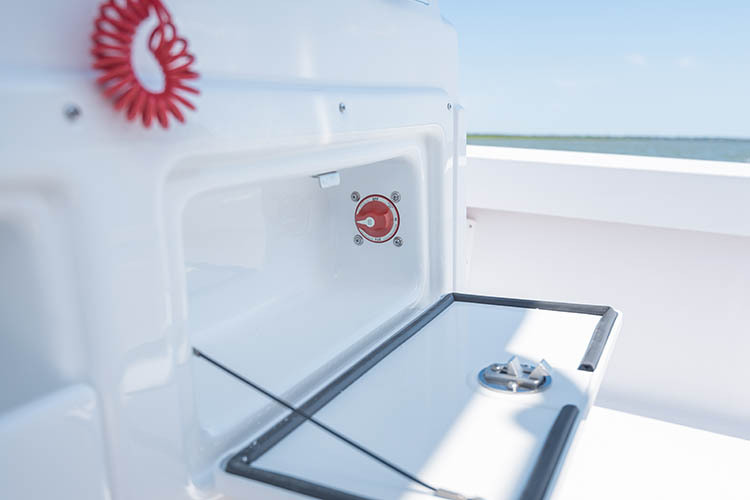 It features a molded catch for the anchor to keep it from falling in and the cut out for your rope on the lid makes it easy to store your extra rope neatly inside the compartment. For ease of installation, we have pre-wired this model to accept a trolling motor. 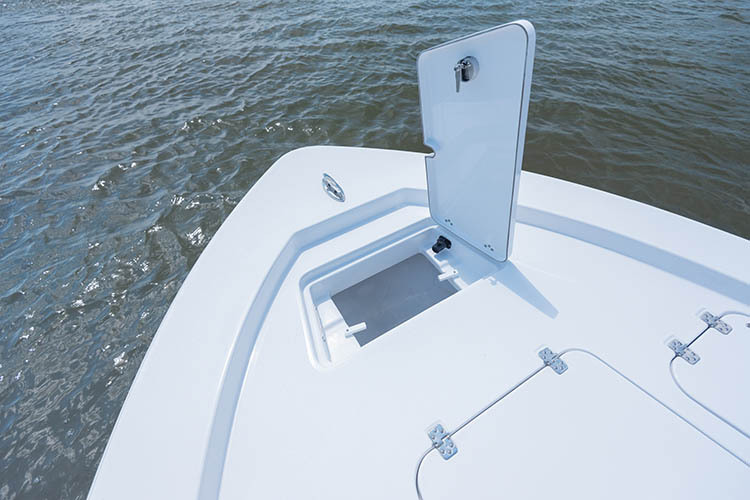 At the bow, there's an electrical connection inside the anchor hatch conveniently located for the optimal bow mounted trolling motor location. This plug's harness runs into the console where the additional batteries and charger will get eventually installed. Comfortable console-front seat with backrest. 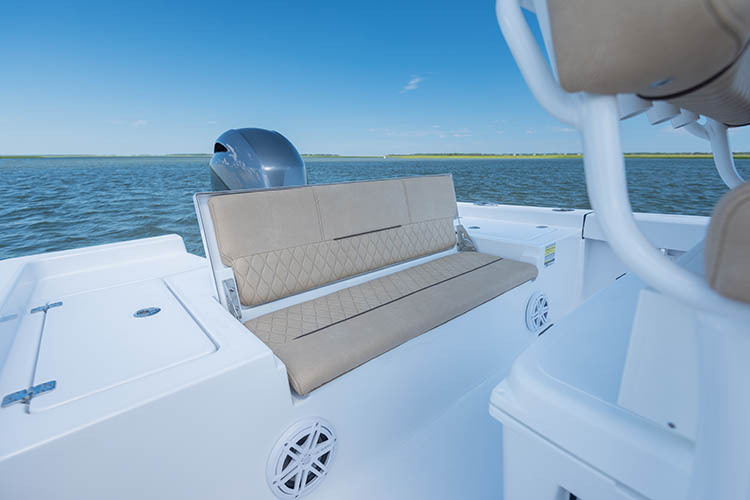 Flip the bottom cushion of the console-front seat to reveal an insulated livewell. 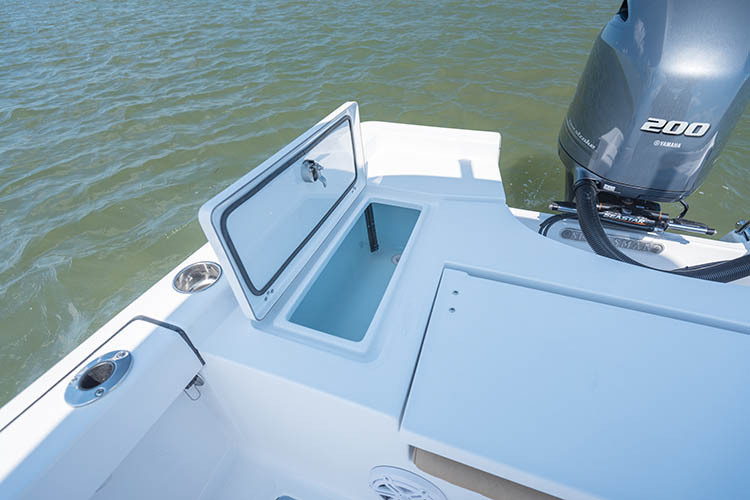 Conveniently located for those fishing up front and for those days you are not fishing, fill it with drinks or use it as storage. 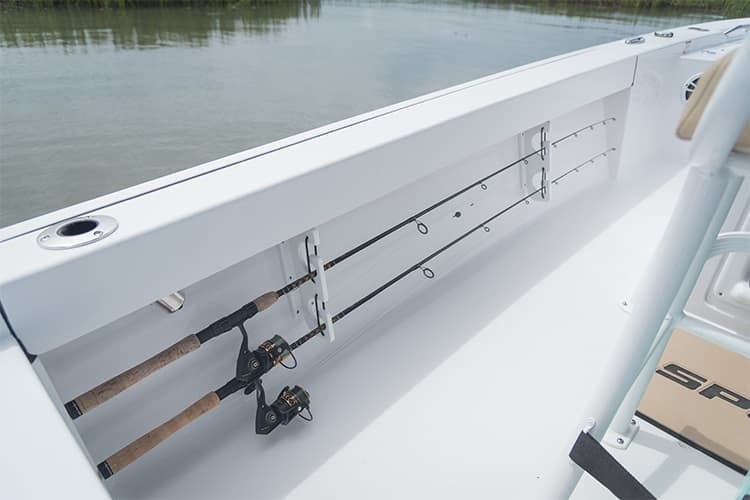 Storage for 4 rods is possible with the under gunwale rod racks. Each can accommodate a full length rod and doubles as a great place to store a gaff or net. Inside the console, there is a built-in lockable storage area. This enclosed space can be used as a changing room or storage of bulky items. On the back wall, there's access to all of the connections to the electronics and fuses, very convenient for quick troubleshooting. This space can also be optionally fitted with a porta potti. 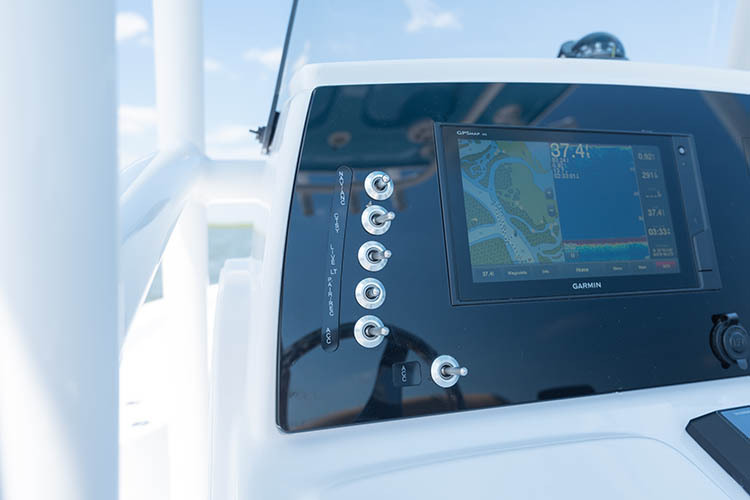 This console windscreen blocks and redirects some of the wind upwards for the comfort of those behind the helm. 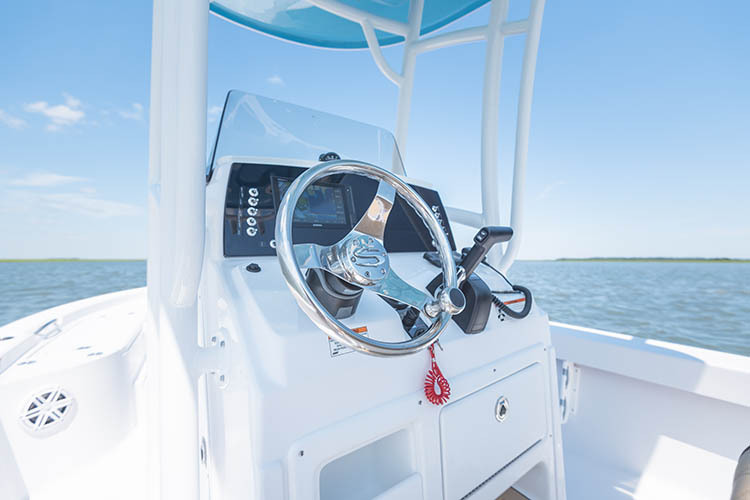 The SeaStar Helm offers over 40 degrees of tilt and locks into 5 different positions and is paired to a high quality stainless steel Sportsman-branded steering wheel with knob. The console layout has comfortable ergonomics for the perfect steering position whether standing up or sitting down. Easily toggle all of your 12V accessories with these labeled and backlit switches, day or night. The angle of the switches allows water to easily flow out when they get wet. 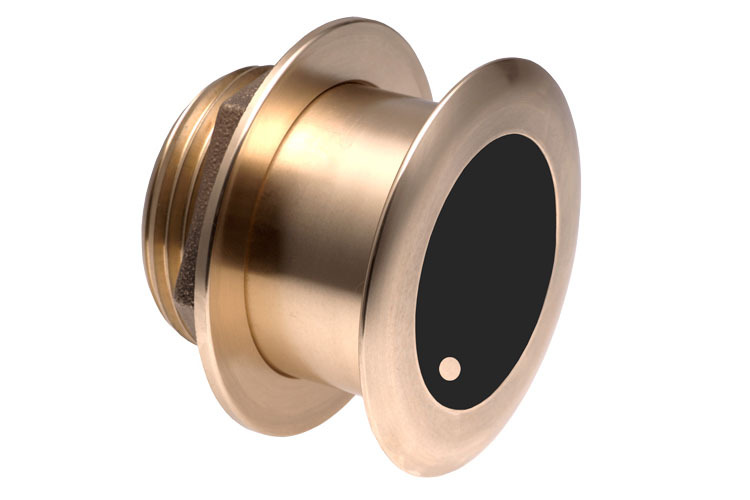 A large red horn button is also located in-dash for easy operation. With the ever-growing demand to keep your devices charged, we include two USB plugs at the helm. The 2 included USB plugs are for charging and will keep your devices charged without interfacing with any other device. It also includes a 12 receptacle where you can plug in any cigarette-lighter style plug. Protecting your electronics from the blaring sun is a breeze with the included dash panel cover. This custom made cover features the Sportsman logo embroidered and is made out of a tough outdoor fabric that will last for years. The safety and reliability of having 2 batteries on board is integral. 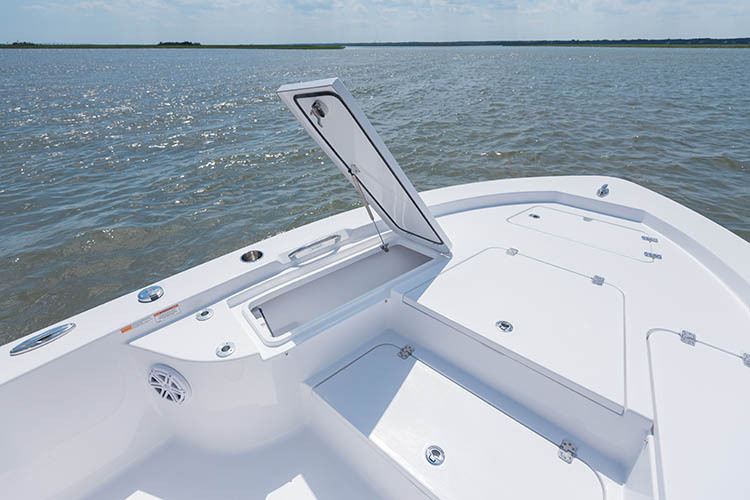 This boat is equipped with 2 batteries and a selector switch conveniently located inside the console. Comfort and function meet when it comes to this deluxe leaning post. 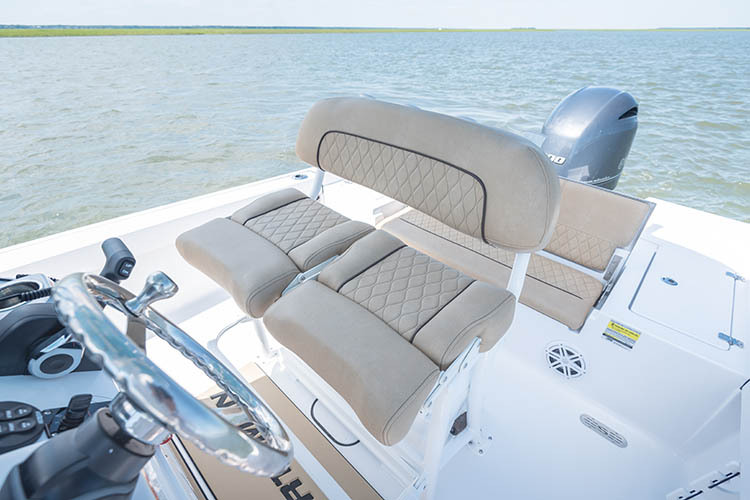 It is designed to accommodate two adults comfortably and features individually adjustable bolsters allowing you to operate your Sportsman standing up or in a seating position. 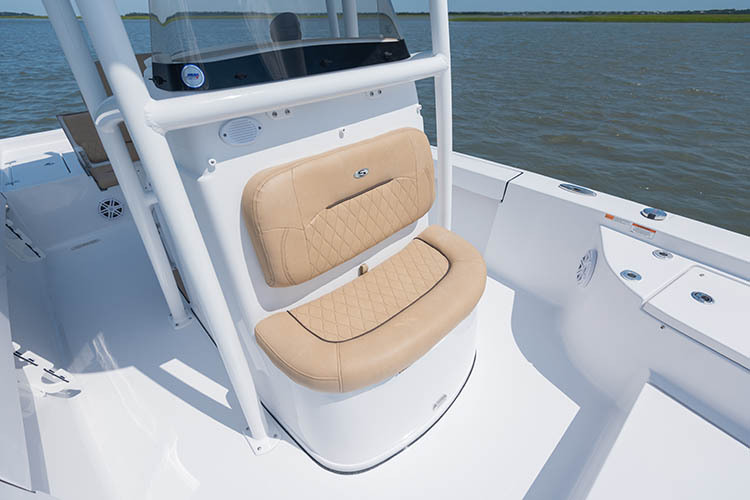 Additional features include a flip-down footrest, rod holders and cooler storage space with a strap. The space under the leaning post allows you to fit a large cooler and strap it securely using the included velcro strap. For additional tackle storage, we offer the "Under Leaning Post Tackle Storage" option which adds additional plastic trays and a storage bin. The "Slide Out Cooler" includes a custom 75qt. ICON cooler in bonefish white. Molded-in bench seating accommodate up to two adults comfortably. 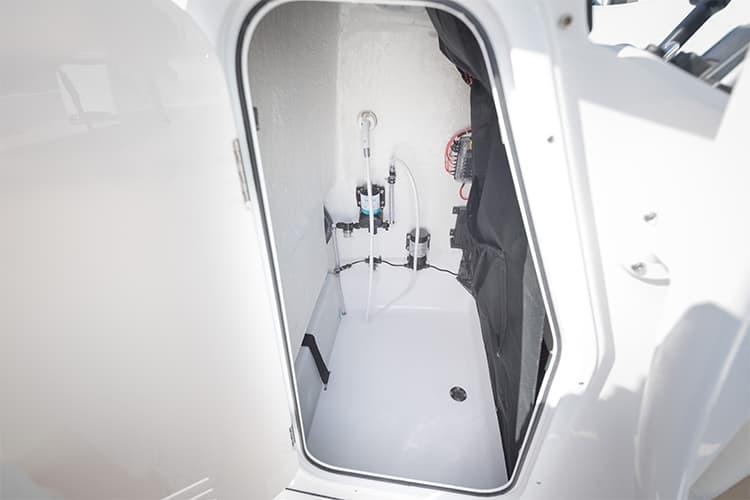 The inboard seating is safer for the little ones than traditional outboard jump seats and the bigger single center cushion, gives you superior access to the bilge. 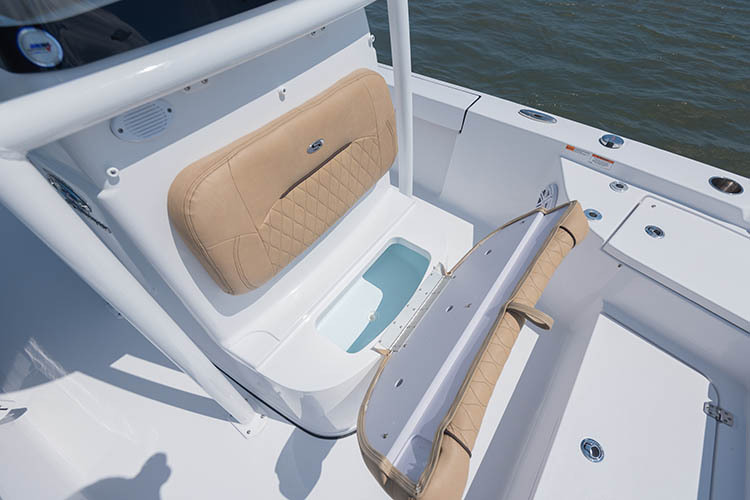 Large rear deck area featuring all recessed hardware, cup holders and plenty of casting space. 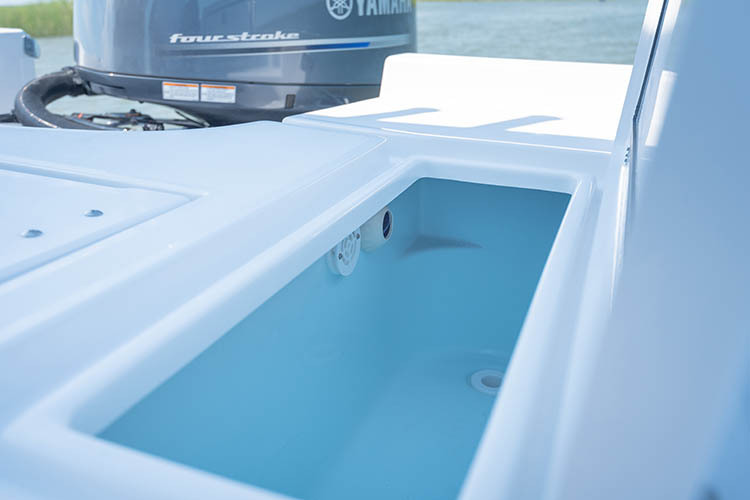 On the port side, find a deep 25-gallon insulated livewell with a recirculating pump. 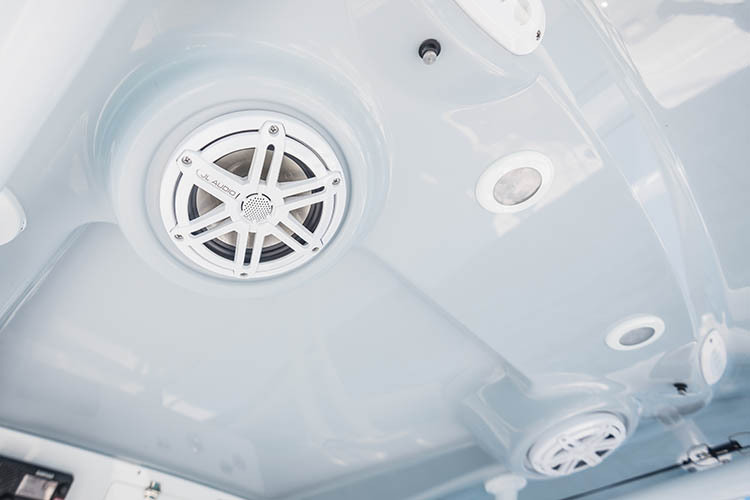 Same size as the port side livewell, the starboard side also features a Pro-Air Bubbler System to ensure your livewell has an oxygen-rich source of air on demand. When the sun goes down, the cockpit comes to life. The included lighting package is as beautiful as it is functional, a blue glow covers every inch of the cockpit for safety and aesthetics. Traditionally, navigation lights are mounted somewhere on the bow in the form of a top mount or pop-up light but this exposes them as an easy damageable target. 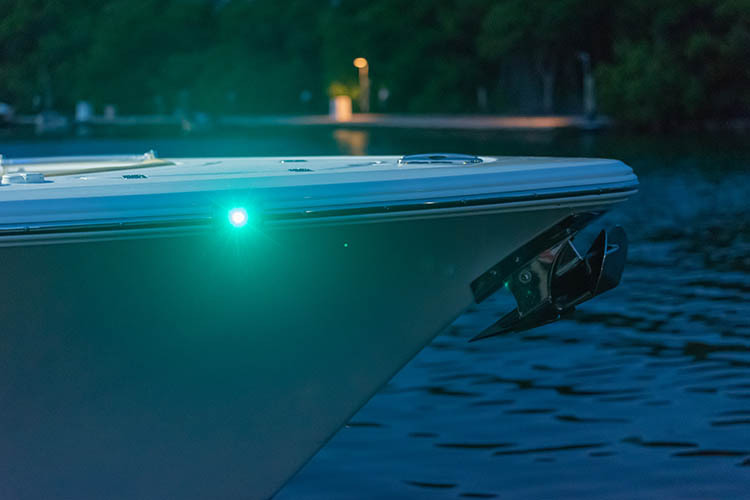 Our rub rail navigation lights are LED, super bright and barely noticeable. The lights are integrated into the rub rail on either side of the bow and provide the ultimate obstruction free installation. 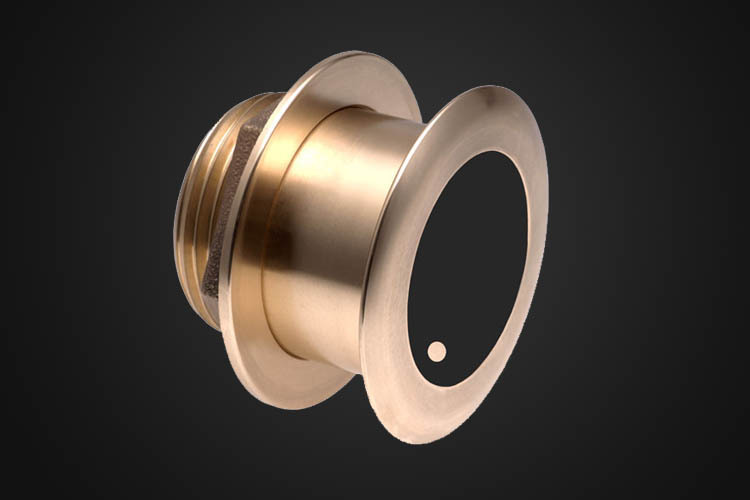 High quality Gemlux pull-up cleats are standard throughout the boat. They offer a flush installation and very smooth operation. 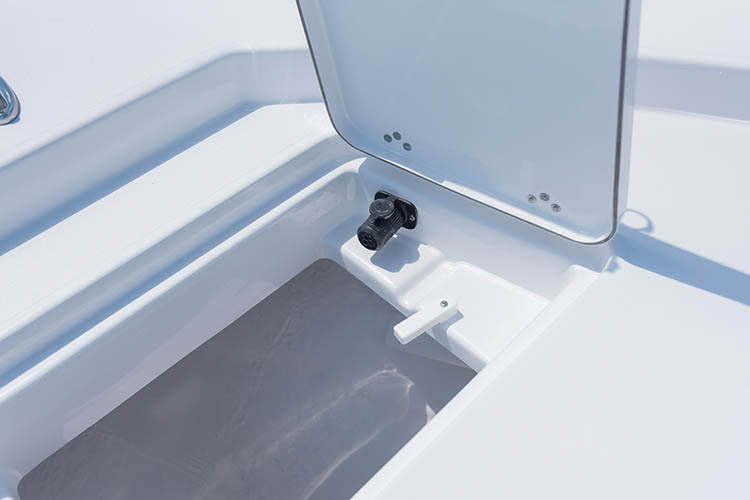 This important safety feature allows any water on the deck to drain overboard and not into the bilge area. Any water that seeps into the bilge, can only be pumped out by the bilge pump, which is slow at draining large amounts of water. 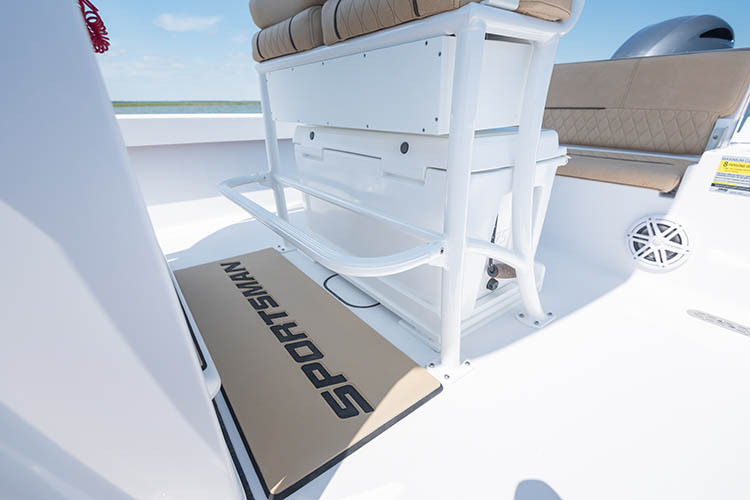 All Sportsman Boats have a collector box drainage system that ties in all drains from the deck and redirects the water directly overboard without mechanical assistance. 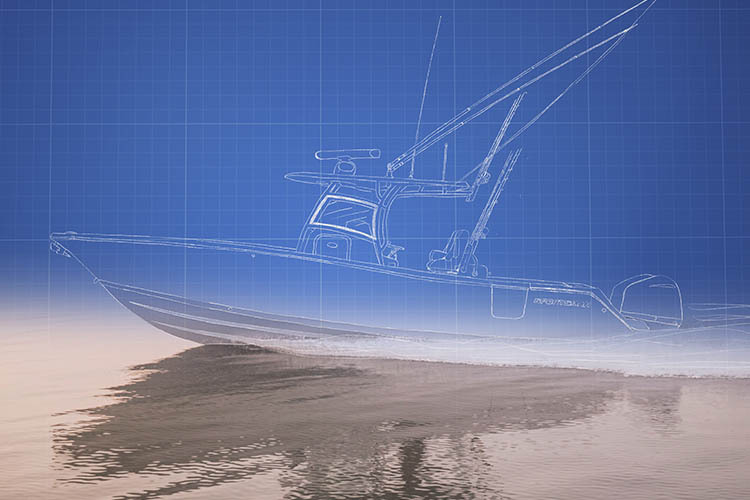 Our SportTech™ hulls feature a no wood, all fiberglass construction, meticulously engineered to withstand the test of time and built using advanced composite materials, resins and bonding agents. 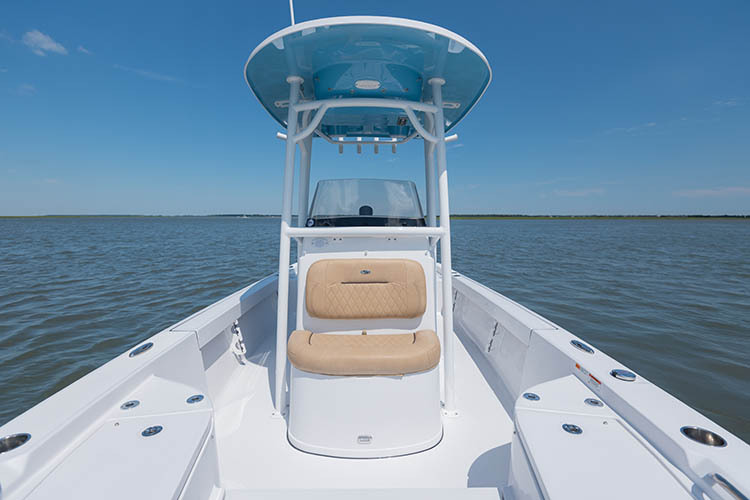 The hulls are crafted with vinyl ester resin for its ultimate weatherability and resistance to water intrusion, a 10-Year Limited Hull Warranty is standard on all Sportsman Boats. 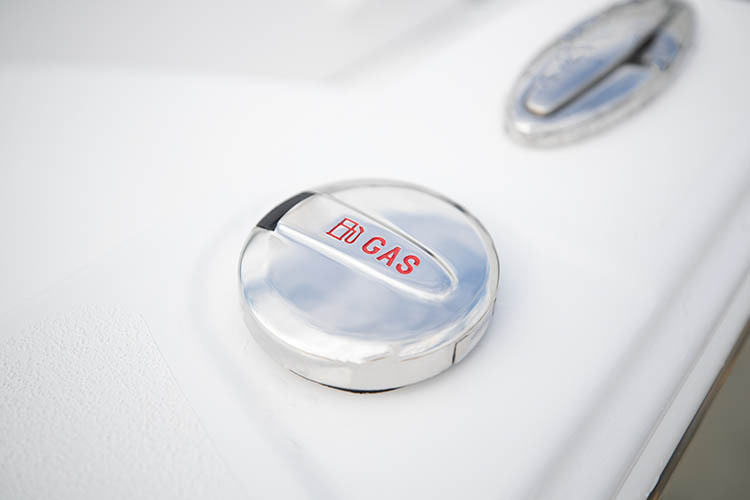 Choosing the engine for your Sportsman Boat doesn't have to be a daunting task. We have tested power options for each model for adequate performance and efficient. 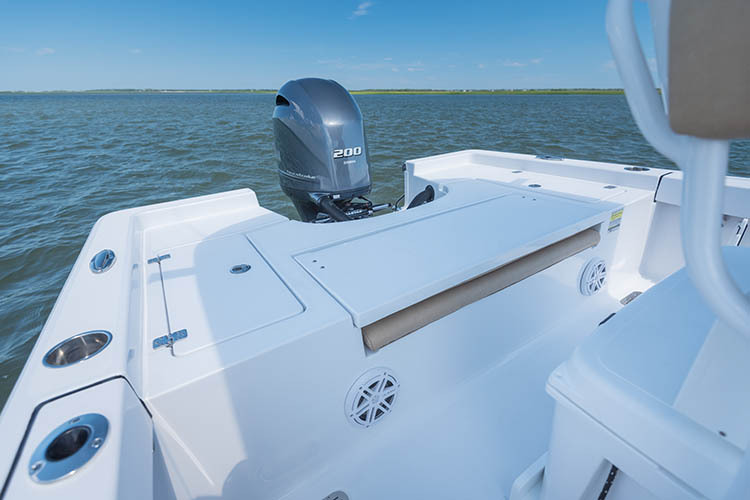 Yamaha offers a wide array of engines and propellers and they have worked with us closely to choose configurations that are going to meet your needs, regardless of your boating style or demands. For more detailed performance information, visit the performance section for this model. 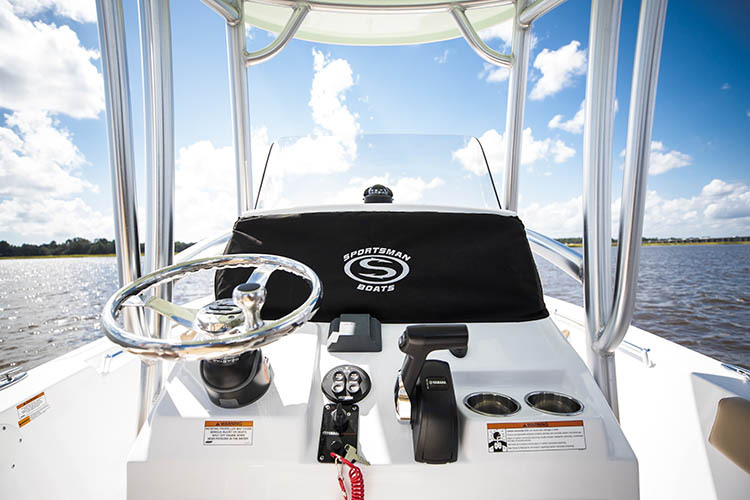 Take control of your electronics with SportLink® Electronics Integration System, equipped standard on every Sportsman Boat. 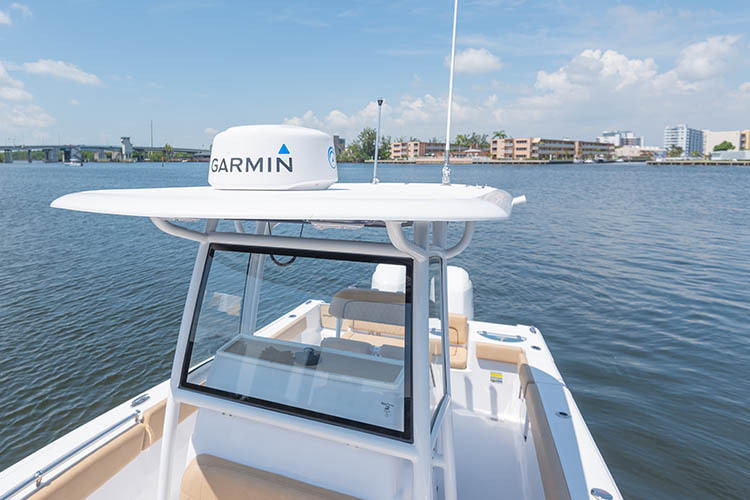 The Garmin & JL Audio powered electronics packages have been carefully designed around each model to meet and exceed your needs out on the water. 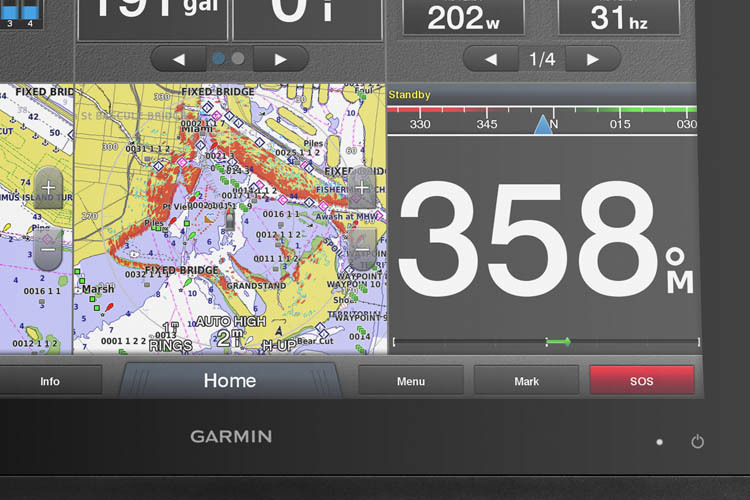 Garmin GPSMAP® 942xs MFD 9"
Experience advanced navigation with the included 9-inch GPSMAP 942xs touchscreen combo. 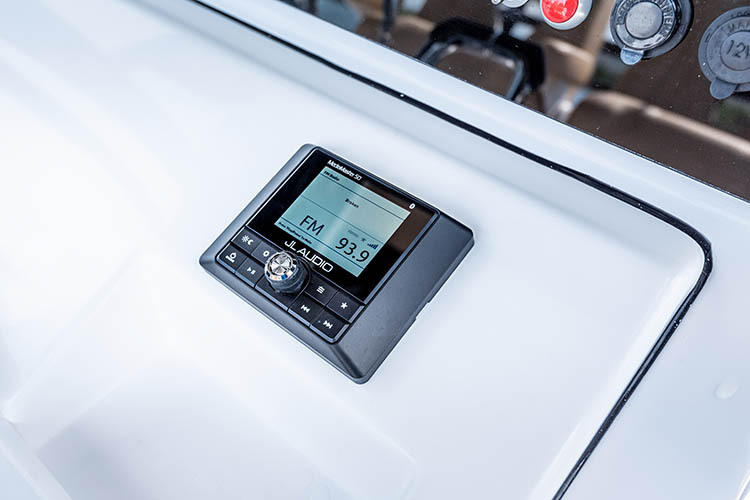 The unit has wireless connectivity features for Garmin mobile apps, NMEA 2000 support and Garmin Marine Network capabilities for radar. You get both LakeVü HD inland waters mapping and BlueChart g2 coastal charts covering the coastal U.S. (East Coast, West Coast, Gulf of Mexico, U.S. and the Canadian side of the Great Lakes). 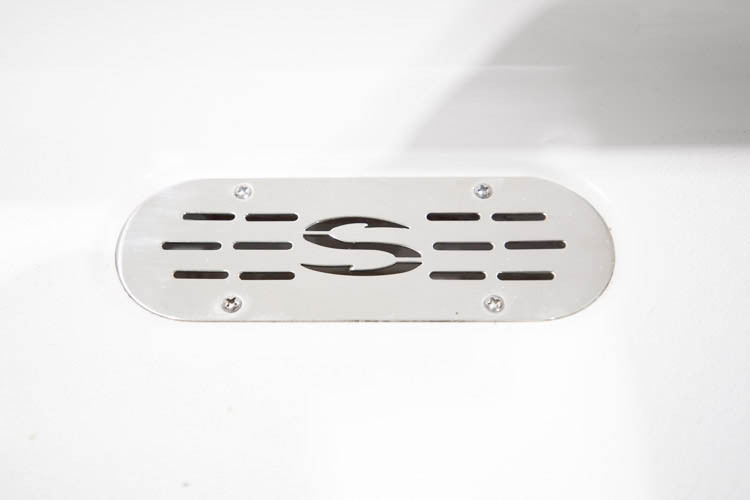 A dual-frequency 600W Tilted Element™ transducer in a low-profile housings that compensate for the boat’s hull deadrise. With a range of up to 1,200 ft @ 50 khz, performance is never compromised. 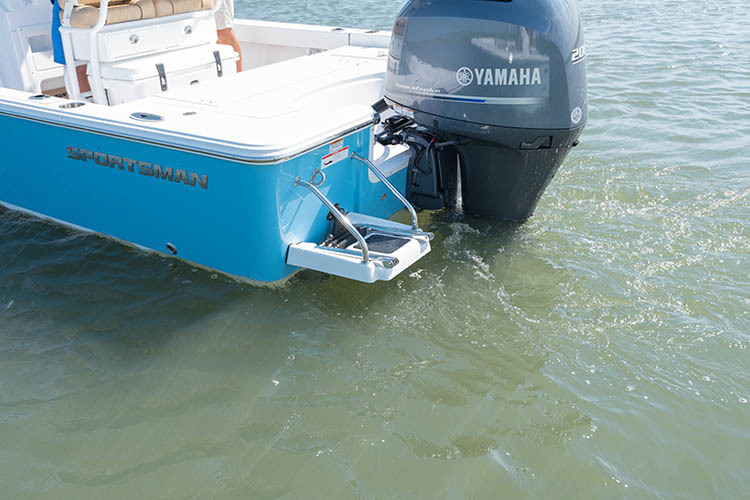 It offers professional and recreational boaters advantages similar to using a fairing block but is installed nearly flush to the hull. 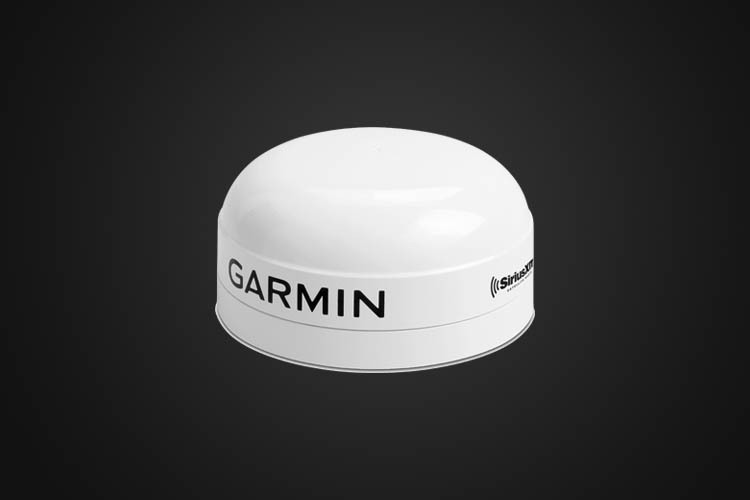 Fully integrated into the SportLink system, this sensor reads the fuel tank level digitally and is able to relay this information to your Garmin screen. Using this information it is able to make accurate calculations on fuel range. Starting with a great foundation is essential. 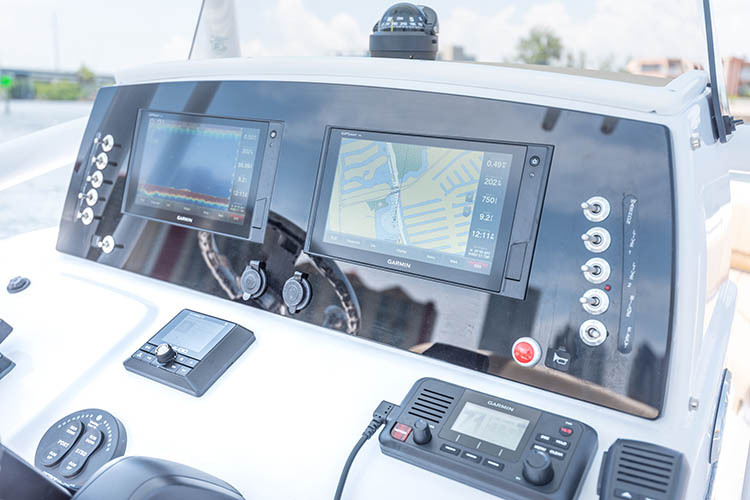 All SportLink® packages are connected using NMEA 2000 communications standard backbone to allow them to communicate with each other flawlessly. 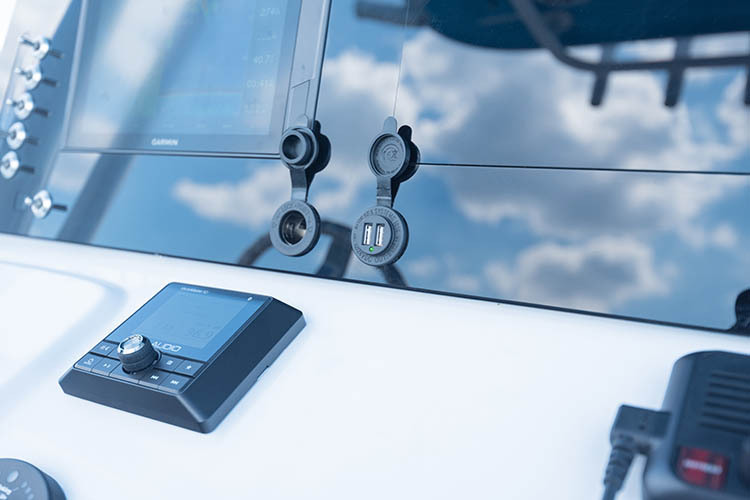 This communications standard system is highly extensible and with hundreds of NMEA 2000 compatible devices, you can expand and customize your electronics endlessly. Communication is critical on the water. 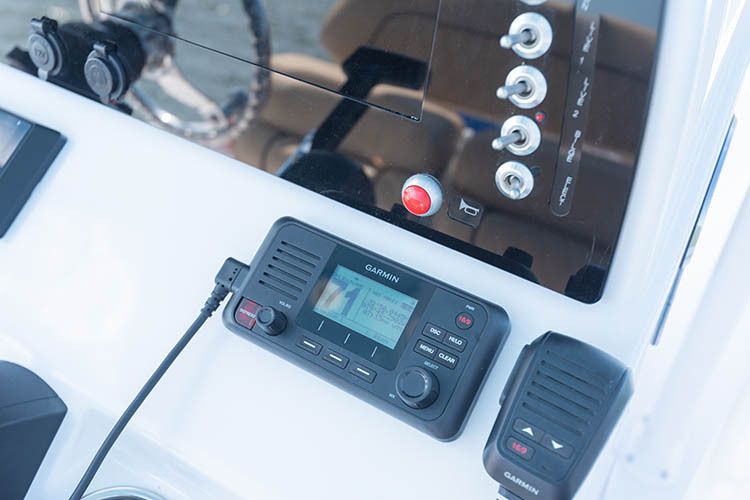 With the VHF 110 radio, you can stay in contact with the shore and other boats in your area. So, no matter where you are or where you’re headed, you’ll maintain communication for a safer voyage. The radio has 25 watts of transmission power, all U.S., Canadian and international marine channels & 10 NOAA weather channels. Reactor 40 autopilot provides relief from manually holding the wheel to maintain course, especially when cruising at moderate to high speeds. 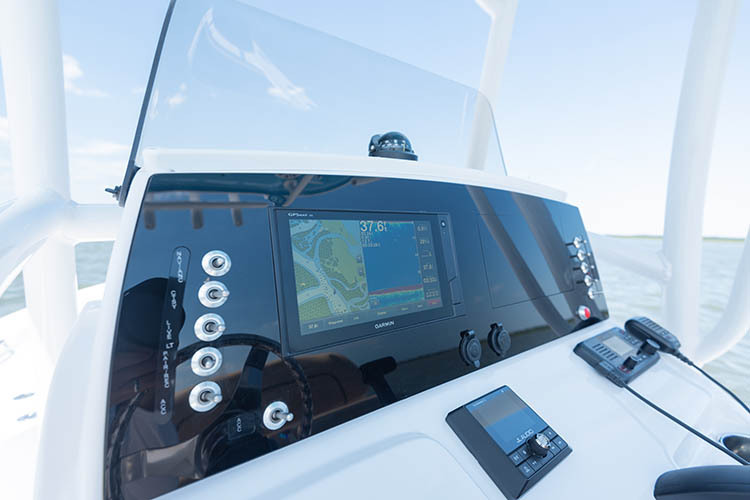 Sit back at the helm and enjoy your time on the water as the solid-state 9-axis AHRS technology delivers a comfortable ride. 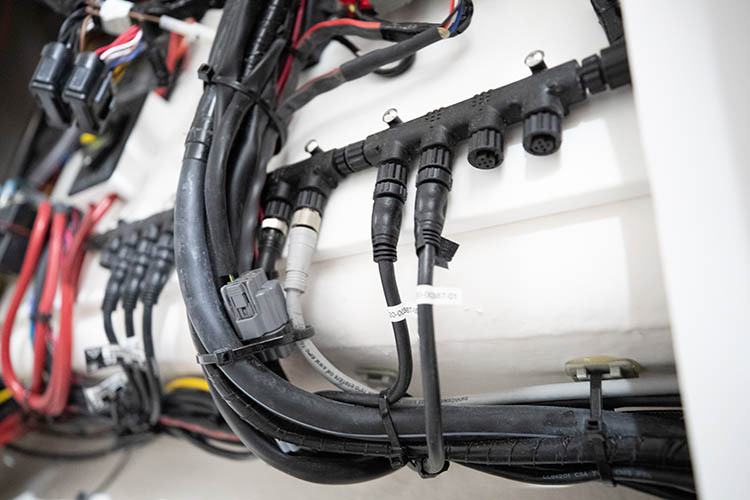 The SeaStar Optimus Electronic Power Steering system raises the bar when it comes to comfort, control and maneuverability. 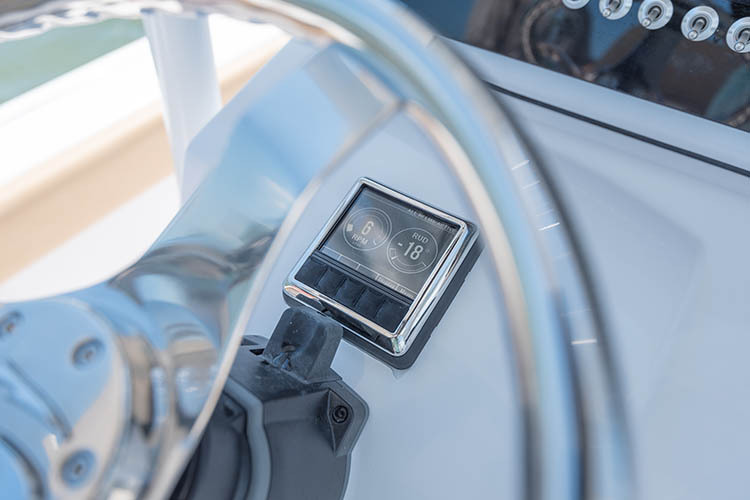 It features adjustable speed sensitive turns lock to lock which means that the number of turns it takes to turn the engine from left to right adjusts automatically depending on the speed the boat is moving at. This truly makes steering feel like a sports car.